It’s amazing what a two-game losing streak will do to you. If I had written this 48 hours ago, when the Red Sox were just coming off a 6-game winning streak amidst a 8-1 road trip, this would probably be titled something like “WHY THE RED SOX WILL WIN EVERY GAME FOR THE REST OF TIME AND THEY WON’T EVEN BE CLOSE” or something along those lines. I’d throw in a pun or two, my editor would take them out (that’s really what our dynamic boils down to [ed. note: I don’t hate puns that much, sheesh]) and that’d be that. But nope, the Red Sox have lost two whole games in a row, and I for one am going to treat this rationally by panicking for 500 words. The Red Sox are a flawed team. I’m not sure there’s such a thing as a not-flawed team, but of the eight teams that will make the MLB postseason, the Red Sox feel particularly vulnerable. There’s imbalance in the rotation, uncertainty in the bullpen, and good lord, everyone is playing with a broken limb. What are the biggest issues heading into this season’s postseason run? IT’S LISTIN’ TIME. The Red Sox offense is very just okay. In fact, I could hear an argument that “very just okay” is a particularly optimistic way to describe it. Dustin Pedroia’s knee is clearly off. It’s being described as “achy”, which is borderline insulting considering the type of medical technology and diagnosing abilities the team’s medical staff posses. During last night’s game, Jerry Remy, who tends to be in the know when it comes to player issues, sounded ominous when discussing just how bad off the knee was. He’ll fight through it because he’s Dustin Pedroia, but when he gets that baby scoped, drained, and rebuilt after hitting .190 this postseason, we’ll all be on the same page. Eduardo Nunez’s knee is apparently not much better, as he tweaked it almost immediately after returning to game action. There’s no timetable on his return, and while he said he’s aiming to see some game action during the Houston series coming up this weekend, that feels overly optimistic. Betts has shown the ability to impact the game in ways outside of hitting all year, as evident by his generally-similar WAR numbers matched up with a underwhelming season at the plate. A wrist injury is a different beast though, and if Betts is swinging with one hand for the next month, the Sox are cooked. It’s bad, guys. He’s hitting .211 over the last month, and .209 in the second half. At this point, would anyone be that surprised if he’s not in the team’s plans for after this season? He’s not going to be playing first base against righties during the playoffs, which isn’t unusual in itself. What makes things tricky is that even when he’s not in the field during those situations, it’s not like he’s the best option at DH, either. If – and that’s a big if – Pedroia and Nunez can play, it stands to reason that the best offensive lineup has both of them in it. Hell, keeping Christian Vazquez’s bat in the lineup when Sandy Leon is catching even makes more sense at this point. A lot’s being made about Ramirez’s spot on the roster, which seems silly at this point. Even with his struggles, his bat coming off the bench in a big spot during the later innings gives me, like, five percent more hope than anyone else the team would trot out there would. His spot on the postseason roster shouldn’t be debated; his spot in any starting lineup should. Pomeranz, at 167 innings pitched this year, is now three away from his career-high. There could be a dozen other reasons for a drop in velocity, but I’m hard-pressed to believe that an unprecedented workload and a sharp dip in velocity aren’t in some way related. He’s getting hit significantly harder over the last month or so, however, which could indicate that some of that classic baseball idiom about throwing instead of pitching might be going on. Might that be the case? Maybe, but it’s 11:30 pm and I’m already above 800 words, so that investigation will have to wait. 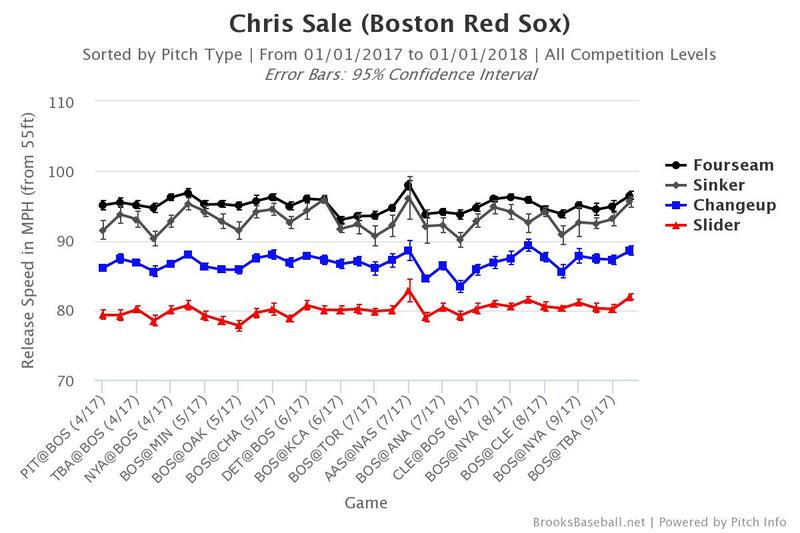 For now, I will say that the numbers, combined with the good ol’ fashioned eye test, make it seem like Sale is dragging some. 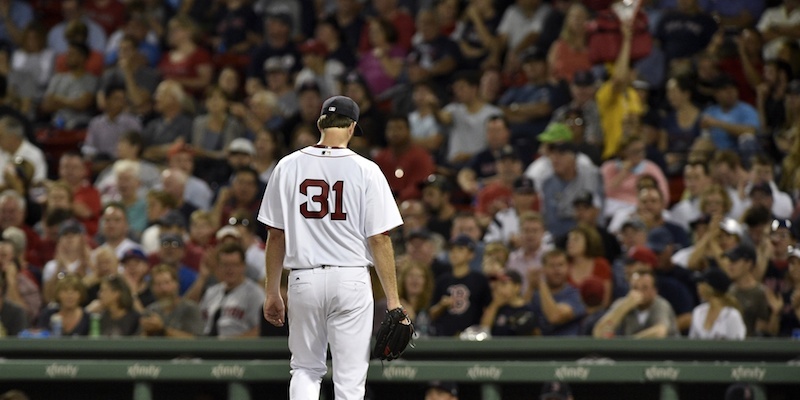 The Red Sox have spent all year preaching that it’ll be the starting pitching that carries them, relying on the belief that pitching dominates the playoffs. If that’s true, and the team sends two of their three starters out to the mound with no gas left and that offense behind them, it’s going to be a short series.